President Francois Hollande has decided to suspend delivery of the first Mistral-class ship to Russia "until further notice," citing the situation in Ukraine as the reason, media reported an Elysee Palace statement. "The President of the Republic believes that the current situation in the east of Ukraine still does not allow the transfer of the first Russian Mistral-type ships to Russia," a statement from the Elysée Palace said. In this regard, Francois Hollande felt it necessary to postpone the new order to study the request for permission to supply Russia with the first Mistral vessel, the communique informed. Russian Deputy Defense Minister Yury Borisov said it will patiently wait for the fulfillment of the contract, RIA Novosti reports. However, Russia will act “strictly according to the contract,” and will sue France should the ship not be delivered at all, Borisov warned. "If [France] won't deliver [Mistral], we’ll sue and impose penalties. The behavior of the Russian side is strictly regulated by the signed contract," he explained, as cited by TASS. Russia will not be begging France for the Mistral-class ships, Russia's permanent representative to the EU, Vladimir Chizhov, told Interfax. He warned that France will face high costs if it fails to fulfill its contract. “We will not beg: yes - yes, no - no. We're a proud country, a great power. In the end of the day, we lived without the ‘Mistrals’ before and will continue to do so just fine, moreover, we know how to make them now,” Chizhov said. “If this is their final decision, then I think it will cost France more than the Mistral [ships] themselves and more than the compensation that Russia will receive,” he said, alluding to the fact that the French-made Mistral-class ships are bought by many other countries, and this decision affects France’s authority and prestige as a partner. Moscow has previously pledged to make financial claims to France if the first of two Mistral warships is not delivered by the end of November. The warning came from a high-ranking source and was made public earlier this month by RIA Novosti. "We are preparing for different scenarios. We are waiting until the end of the month [the fulfillment of Mistral deal], then we will make serious claims," the source said on condition of anonymity. 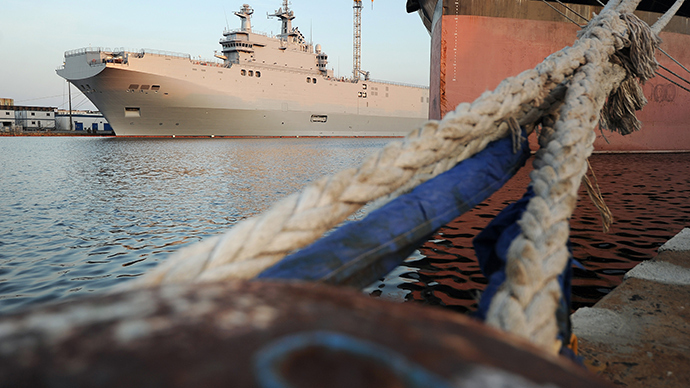 France already missed a mid-November deadline for handing over the first of the amphibious assault ships to Russia. On November 16, one of the France’s biggest union federations, Workers’ Force, called on Paris to fulfill the Mistral deal and deliver the two warships to Russia, otherwise 2,500 shipyard employees may lose their jobs. Le Figaro reported that the union expressed "shock and outrage" after Paris put off the delivery due to pressure from the US and EU, which imposed several waves of sanctions against Moscow after Crimea joined Russia amid the Ukraine crisis. Russia and France signed a €1.12 billion ($1.6 billion) contract for two Mistral-class ships back in June 2011. Under the deal, Russia was due to receive the first of the two warships, the Vladivostok, last month, but Paris stalled the consignment. France has been falling between two stools, trying to buy more time by neither breaking the contract in non-ambiguous terms nor delivering on it. Both Washington and Brussels have pressed Paris into suspending the contract for two Mistral ships - clearly as part of an ongoing strategy to pressure Moscow with sanctions over its perceived involvement in the Ukrainian crisis. Meanwhile, France faces a multibillion-dollar fine if it fails to deliver, under the terms of the contract. Back in September several hundred protesters gathered in western France, in the harbor of Saint-Nazaire, to protest against the French government's decision to suspend the delivery of a Mistral warship to Russia. People gathered by the docked Vladivostok were holding banners that read, "Hollande wants to kill Saint-Nazaire. We say no,” and “Let's deliver Mistral and provide our citizens with job" and "For the victory of Mistral, for our independence."